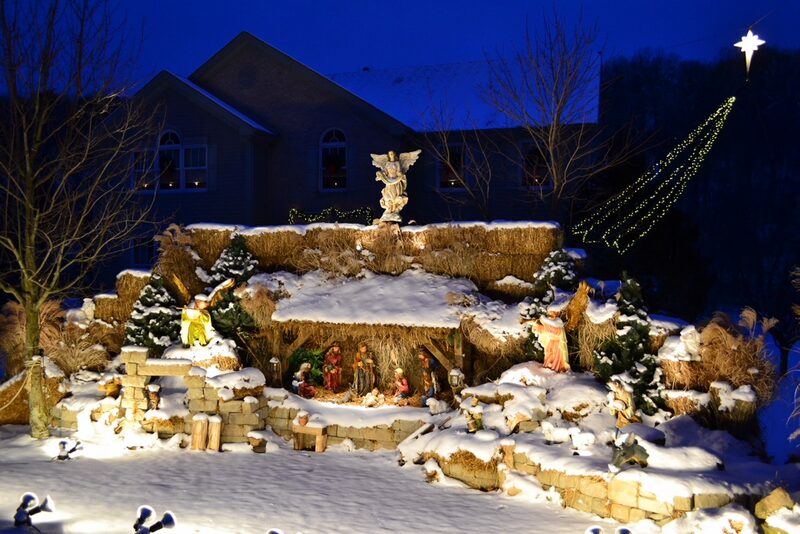 Ever since Saint Francis of Assisi and Saint Claire used live animals and local villagers to stage the Christmas Nativity, Christians in North America and around the world have used all variety of materials and figures to represent the birth of Jesus Christ. These include banana leaves, wood and straw in Mexico, carved wood figures in the Philippines, plastic resin and fiberglass statues in the US and Canada and Renaissance marble works of art in Europe. Our offerings for Outdoor Nativity Scenes are neither wood and straw nor marble, but rather fiberglass and plastic resin. These are manufactured in Asia using processes similar to building a small boat, which, hopefully will make them durable and long lasting. They are finished with sunlight resistant paint. The figures are fairly heavy, weighing as much as 90 pounds for a large life size King. Nevertheless, we strongly recommend some sort of tethering for each piece to reduce the possibility of damage from tipping over and vandalism as well as theft. We also offer Nativity Sets with a two dimensional “cut out” look in painted wood. Each of these pieces comes with a base and attachments which can be used to create an attractive tableau in limited space. China’s Christmas Industry Predicting Worldwide Inflation? Many of the labels on our Christmas decorations say “Made in China” but few of us realize that more than 60% of the world’s Christmas goods come from China. The very low profit Chinese Christmas industry has suffered recent difficulties which could predict problems for Chinese and worldwide manufacturing. Some of these problems are common to low wage developing countries and include the rising cost of city living as workers move from rural villages with family support and low living costs. Manufacturers in the Chinese Christmas industry have been forced to increase wages as much as 150% and still have faced labor shortages. Factor in the increasing average age of Chinese workers and their reluctance to work long hours for low wages and live in factory dormitories thousand of mile from their home villages and you can predict more labor shortages for this and other low wage industries. The government has encouraged many factories to relocate inland where cheap labor is more available, but these new locations do not provide the raw material supply, skilled trades and lower transport costs now enjoyed by the ” coastal pods” of Christmas product manufacturers. Rising material costs are also pressuring the industry. Commodity prices, led by oil and copper, are increasing worldwide. Rising oil prices impact on the transport cost of everything. In addition oil is the feedstock for many plastic resins used in the manufacture of many Christmas articles. Raw materials are estimated to make up 40% of the cost of Christmas products. Since profit margins are so low in the very competitive Chinese Christmas business, these problems could become the “canary in the coal mine” for many industries worldwide as China, with its huge demand is driving up commodity prices and exporting inflation and low wage jobs. The Christmas business will likely continue to be centered in China as no other low age country has the labor supply, concentration of efficient factories and industrial infrastructure to support mass production. Nevertheless, countries such as Vietnam, Bangladesh and even the the Philippines and Indonesia will experience a rapid growth of low wage jobs. Owning and running a Christmas product website pretty much means that it is Christmas all year. What with, planning, buying, receiving, updating, photographing, contacting customers, selling and shipping we are busy with Christmas ten and a half to eleven months a year. The main problem with this, as my banker reminds me, is that we make about 70% of our sales in the months of October, November and December. The obvious solution is to create a counter-seasonal business with sales concentrated in the spring and summer. The easy answer would be a garden product website. Unfortunately, a lot of other smart people had the same idea, so there are many good websites selling planters, birdbaths, fountains and garden statues and ornaments. Rather than find ourselves offering a “me too” website competing mainly on price, we decided to continue our emphasis on the religious aspects of Christmas by offering religious garden statues. The natural focus was easy to find. Among Christian saints, Saint Francis of Assisi, often referred to as the “patron saint of the birds and the bees” has a compelling story which appeals to modern sensibilities. He was the first environmentalist and he celebrated Christmas with “live” Nativity scenes using local village people and farm animals. Our vision for the website and product mix was formed during visits to beautiful and peaceful monastery gardens and churchyards in the US, Mexico and Europe. In addition to Saint Francis, we now emphasize, Jesus, Mother Mary and several other Catholic saints. We now have nice counterbalance to our Christmas business and we continue to study the saints. What are the “true” Nativity Figures? If we trace back the development of today’s representation of the birth of Jesus, “The Christmas Creche” we start with the Holy Family, Jesus, Mary and Joseph, plus some barnyard animals. An early addition was shepherds, who had been visited by angels, and sheep, plus a lamb, which is consistent with the stories in the bible. St Francis of Assisi used live animals and village people to play the various roles for his creation of the Nativity. A controversy arises with the addition of the Magi or three “Wise Men”. These figures are described by Matthew as visiting the Holy Family in a house as much as two years after Jesus” birth. The purpose of their visit and the role of the Magi is shrouded in mystery and the politics of the day. One version has the Magi coming from Persia (Iran) as spies against Israel and the Roman Empire, which it was part of. The Magi of ancient Persia were priests with great political influence and reputation for powerful knowledge, even magic. According to this story, the Magi followed a star, (probably the North Star for navigation, but it may have been a comet) and traveled at night. This may have been to avoid the heat of the day or to evade the Roman soldiers who policed Israel in those days. We all know how this ended with the three Magi,bearing gifts, found Jesus and confirmed the wonderful story of the shepherds and the Angel marking this as an unusual birth event. So now our creche has the three Kings-the Magi and at least one camel, which they traveled on. More about Nativity figures in another post.